Last week, I shared my musical background and my music education. 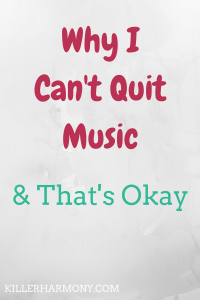 This week, I want to talk about why I can’t stop playing music and why I can’t just let music go. I love music more than anything, and while I have other strengths, such as blogging, music far surpasses everything else. In the past few months as I have prepared to graduate and join the real world, I have gone through many phases regarding my future as a musician. At the start of this (academic) year, I was gung-ho, ready to apply for graduate school. Then I had a phase where I wanted to quit music and couldn’t wait to be done. Now, I am somewhere in the middle, right where I should be. I don’t want to quit music, because I have spent too much time on it, but graduate school is not for me. At least not right now. As a musician in the 21st century, there are actually a lot of ways in which I can make money. I am no longer limited to finding an orchestra job or a college teaching job. I can do whatever I want with music. Granted, most of what I can do is very high risk. I have to spend the time and money to create stuff and then try and sell it. I won’t have much income for awhile, and that is okay with me. I will be living at home, so I won’t have to pay for rent, which is nice. I might find a part time job to fill in the gaps as I am getting started. Now, graduate school is not in my immediate future, but I might apply within the next year or two. Over the summer and fall, I want to discover what I like and don’t like about music. That way, I can figure out the best program for me. I am good at a lot of things, but the thing I am best at is music. I pick up instruments fairly easily, and I can learn music theory almost in my sleep. I could pursue a career working with languages, because that is another passion of mine. However, I have yet to become fluent in a language other than English. Meanwhile, I have been good enough to perform on almost a dozen instruments. Let that sink in. So, while music is not the only thing I am good at, it is the only thing that I have a huge passion for and can see myself doing full time. That is especially true because most musicians do not just play music all day. They have to contact clients, students and parents, book lessons and gigs, and a ton of other stuff. I think that all of the strengths I do have for music, writing, managing a website and online presence and more, can all come together to help me build my music career. Now, some people, including my oh so loving parents, wonder how on earth I can make money with music. People think that musicians should find a “real” job and pursue their passion on the side. While I understand where these people are coming from, that isn’t always possible. I know that with me, I would be miserable in most day jobs. I would dread sitting at work all day doing something that I could not care less about. When work is over, I would be too worn out to even think about touching my flute. Yes, being a musician is going to be tough, and I will be broke. But I know that it will be so fulfilling for me to work with music all day. The point of telling you all this is to share my story and to encourage any budding to musician to at least try to pursue a career as a musician. It will be difficult, and you will struggle with money and time, but it will be worth it. If there is nothing else you would rather do, then go for it. If you could handle a day job with music as your hobby, that might be a better choice. But, if like me, you don’t think of anything besides the music you want to play, how you would teach future students or what sort of music you want to make, music just might be for you. Hopefully next week I can come up with a more educational post, but graduation and my career have been at the forefront of my mind this week so…we shall see what the future brings. I hope you gained something from this post. If you are a student, maybe it got you thinking about your future. If you are a parent, I hope that I can set your mind at ease. And for the pros out there, you did it. You’re a musician. What sorts of blog posts (or videos) would you like to see? Let me know in the comments! Welcome to the new niche of Killer Harmony! I am going to be writing about music from now on. You don’t have to understand music to read and learn from these future blog posts. I merely want to share my love of music with the world. In today’s post, I am going to share my music education with you all. That way, you can get a better understanding of where I am coming from when I write about music and how music has shaped me. I have played some sort of instrument (or sang) for most of my life, and I know I would not be the same without that musical experience. My first musical instrument was the violin. I took lessons for a few months when I was five or six years old. I ended up quitting, because I never wanted to practice. I just wasn’t passionate enough about the violin, and the quitting pattern, as you will see, continued. A little while after quitting violin, I started learning the piano. My parents bought a used piano to keep in the family room, and I was able to learn a new instrument. Of course, that didn’t last long. I also lost the motivation to practice for my lessons. Such is life, I suppose. I ended up following the same pattern of violin > quit > piano > quit again a few years later. At the beginning of fourth grade, I got to try the violin again, and I decided to join the beginning strings program at my school. Since I was a bit older, I enjoyed it a little more, but it didn’t last. While I liked the violin, continuing after fourth grade meant getting up early, going to a different school than my own for an hour, then taking a bus to my regular school. After the first year, my district combined the strings between a few schools, so we couldn’t practice during a time like recess. That following summer, I took piano lessons from a new teacher. I enjoyed them, and I don’t really remember why I quit. I can only assume it’s because I never practiced. In fifth grade, I remember wanting to play flute, but I wasn’t able to. I distinctly remember my mom telling me no, though she remembers asking me if I would practice. My response was no. Near then end of elementary school and in middle school, I did some singing. I joined choir for fifth and sixth grades, and I participated in the musical in sixth and seventh grades. I liked singing, but I never considered taking lessons. At the end of eighth grade, I took some drum set lessons. They were okay, but the exercises felt monotonous. I wanted to play the drums…not work on rhythm studies. High school was when I really came into my own as a musician. I started saxophone as a freshman, and I continued playing that for over four years. I also picked piano back up so that I could join my school’s contemporary music band. It was through that band that I started flute. I began playing flute my junior year and became serious about it my senior year. Even though I had not been playing flute very long, I wanted to make it my primary instrument. I never really felt as strong of a connection with any other instrument, so I had to give it a chance. I settled on a major in flute performance, because of my musical background and my drive to succeed. While I have not played flute for as long as some of my peers, I have managed to increase my skills tremendously over the past few years. I plan on pursuing music as a career, and I intend to use this blog as a platform to help my career. I love advocating for music, and I love teaching others. In my career, I want to teach, perform, compose and more. I hope you will stay for the ride. What sort of content would you like to see from me? Let me know in the comments, and be sure to follow my Instagram (@KillerHarmony) for a look into my life. Taking My Own Advice + Big News! If you have follows my blog for awhile, you would know that I am all about doing what makes you happy. I have written posts on why it’s okay to transfer in college, why you should pursue your passion and more. After taking time to think about things, I realized that I should take my own advice. As my time on college is coming to an end, I have lost motivation for writing about college. I still love helping people through my writing, but I will be making some changes here on Killer Harmony. I started this blog with the idea of writing about music, hence the name. I then moved to writing about college so that I could widen my reach, and it worked. However, I know that I am more passionate about music and sharing that. There are tons of other college bloggers, and I don’t feel like I can do justice to college related topics anymore. I will soon be earning my degree in music performance, and I want to share what I have learned with the world. I will be writing about learning how to play music or read music, and I want to help people of all levels express themselves through music! With recent events in funding for the arts, music is more important now than ever. I sincerely believe that music can change a person’s life, and I want to advocate for music. With these changes to the blog niche, I am also going to be posting on Mondays again. Tuesdays never felt right to me, and I think Monday will work much better. It gives me the whole week to work on a post, and you as readers can catch up whenever. I would also like to start doing some more audio or video recording to post on the blog. That might not start until mid May, but it is something that I want to do. As I said above, I have not been as motives to write for this blog as I once was. That is okay, as people and interests change. With the changes, I have decided that I need to take this blog in another direction. Music is a passion of mine that will never die, yet my passion for helping college students has started to dwindle. I need to write about what I love so that I won’t give up as easily. I realize that I might be alienating some of you, but I hope you stick around. At first, I plan to write posts about music that anyone can understand. I have some ideas brewing, and you don’t need any sort of musical knowledge to read them. I hope that my passion will come through in these future posts and that you consider reading a few of them before clicking away for the last time. Promoting Music: Listening, Education and more. I want to write about classical music and make it interesting. This generation has had some bad luck regarding classical music. School budgets have been cut, classical music is rarely played outside of specific venues and I want that to change. I want to open your eyes and ears to a new world. I will teach some of the basics so that you can understand and appreciate music of all genres in a new way. I want to make music more accessible to you all through the use of this blog, social media and other methods on the internet. Are you excited for the changes coming? 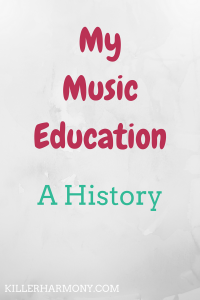 I hope you enjoy reading and learning about music. Let me know what you want to see in the comments or on Twitter (@HannahHaefele)! 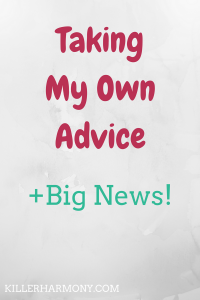 Author HannahPosted on April 10, 2017 April 9, 2017 Categories OtherLeave a comment on Taking My Own Advice + Big News! 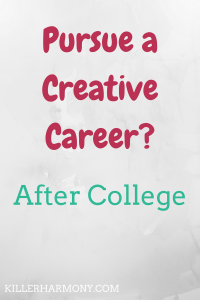 Should You Pursue a Creative Career? If you are majoring in the arts and humanities, you might be wondering if you made the right choice. After all, careers in the arts are hard to come by whereas STEM (science, technology, engineering and math) careers are increasing. While I can’t decide for you, there are some things to consider when pursuing a creative field. If you are majoring in a creative subject, odds are you are already passionate about it. Music, art, theatre and design are all majors that require some previous interest and skill. Creative careers are harder than “normal” jobs, though. You might have long hours, tight deadlines or be constantly on the road. Creative jobs require different things than your typical job. That is why you should be certain creativity is the path for you. Here is how you can determine if being creative is your calling. 1. There’s Nothing You’d Rather Do. If the only thing you can see yourself doing is your creative passion, go for it. For some people, deciding to be a musician, writer or artist is easy. It’s they only path they want to go down. Questioning your choice does not automatically mean you should not pursue it, though. Knowing that your passion is what gets you up in the morning is a sure sign that you made the right choice. You’re not interested in a regular job, so you spend all of your free time working on your craft. 2. It Consumes Your Thoughts. If all you ever think about is writing your next story or giving your next performance, you are destined for creating. The way to success in a creative field is that constant drive and passion that makes you work hard. If your craft is all you ever think about, you can be sure that it is the only way you will be happy. This coincides with the first point, but if your art consumes you and your thoughts, it is worth a shot to make it your career. 3. You Love Being Challenged. Most day jobs involve showing up at the same time each day to do the same thing. That’s not the case with creative jobs. Every day will be different. You will have a lot of work to do one day then maybe a chill day the next. These creative jobs also involve challenges. You will probably have to keep looking for work on a regular basis, proving yourself over and over. If that doesn’t faze you, you can go into a creative career with an edge that not everyone will have. 4. A Normal Day Job Sounds Boring. If you can’t bear the thought of working for the same old company day after day, year after year, a normal day job won’t make you happy. Most creative people need creative stimuli to avoid getting bored. While some jobs can be interesting, you won’t be fulfilled if you aren’t working on your craft. A daily routine is nice for some people, but not everyone needs that structure. If you know that you would be bored in a day job or that it won’t make you happy, don’t force it. Being creative is a great thing, but it’s not always possible in a normal job. If being creative is what will make you happy, you should pursue that. 5. Happiness is more Important than Money. I’m not going to say that you shouldn’t make money. We all need some money to live and survive. But, there comes a point where making a ton of money is not worth the unhappiness you have to face. Most creative careers don’t lead to a rich lifestyle; the term starving artist is not just a term. Most creative people get past this, though, because their creative pursuit makes them immensely happy. If you know that happiness is more important to you than a fat pay check, you should pursue your creativity as a career. You will thank yourself later. Do you want a career in the arts? What makes you do what you do? Let me know in the comments or on Twitter (@HannahHaefele)! Author HannahPosted on April 3, 2017 April 2, 2017 Categories CareerLeave a comment on Should You Pursue a Creative Career?